Mr. Cepeda-Díaz’s practice areas include general civil and commercial litigation, securities arbitration, environmental litigation, healthcare facility liability, products liability, antitrust and trade regulation, and distribution. He has trial experience in both the Federal and Puerto Rico courts and has presented oral arguments before the First Circuit Court of Appeals. As a law student, he worked three semesters as Student Law Clerk to Judge García-Gregory and one summer as an intern in the chambers of U.S. Circuit Judge Juan R. Torruella of the U.S. Court of Appeals for the First Circuit. He also served as an Associate Editor of the University of Puerto Rico Law Review. 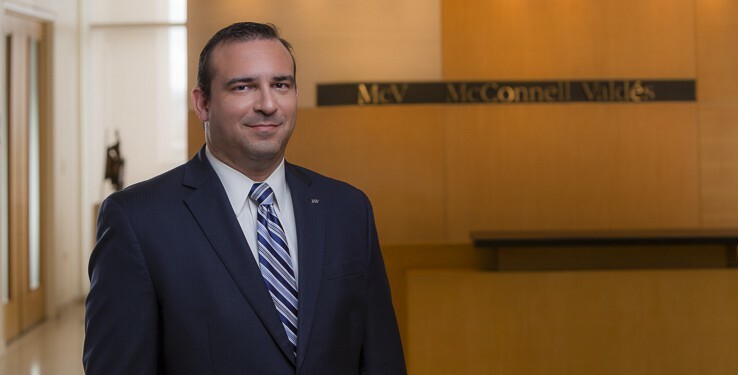 Before joining McConnell Valdés, he worked as a Law Clerk in the U.S. District Court for the District of Puerto Rico. He first served a three-year term with U.S. District Judge Jay A. García-Gregory, followed by a one-year term with then newly-appointed U.S. District Judge Francisco A. Besosa. Quality Cleaning Products R.C., Inc. v. SCA Tissue North America, LLC, --F.3d--, 2015 WL 4443219 (1st Cir. July 21, 2015) – In this case brought under Puerto Rico Dealers Act, Law 75, Mr. Cepeda-Díaz presented the oral argument on behalf of the defendant before the First Circuit, which affirmed the dismissal of the complaint on statute of limitations grounds. In an issue of first impression, the Court of Appeals held that Law 75’s statute of limitations cannot be tolled by recourse to the “continuing violation” theory. It further held that when a Federal Court exercises diversity of citizenship jurisdiction it must apply both the relevant state statute of limitations and its statute’s accrual rules. Mendez Internet Management Services, Inc. v. Banco Santander de Puerto Rico, et al. 2009 WL 1392189 (D.P.R. May 15, 2009); affd. 621 F.3d 10 (1st Cir. 2010): In this litigation which presented claims brought under the Racketeer Influenced and Corrupt Organizations Act, the Sherman Act, and the Bank Holding Company Act against several banking institutions Mr. Cepeda-Díaz was an integral part of the team who successfully obtained the dismissal of complaint at the pleading state. The dismissal was later affirmed by the Court of Appeals for the First Circuit. In re Puerto Rican Cabotage Antitrust Litigation, Civil No. 08-md-1960 (DRD) (D.P.R) : Class action lawsuit brought under the Sherman Act, which was consolidated in a Multi-District Litigation. Mr. Cepeda-Díaz was part of the team who obtained a partial dismissal due to the insufficiency of the allegations to connect the client to an alleged conspiracy to fix cabotage prices between Puerto Rico and the U.S. mainland. In re MTBE Product Liability Litigation, Civil No. 07-10470 (SAS) (S.D.N.Y.) : Multi-District Litigation currently pending before the U.S. District Court for the Southern District of New York. In a complaint brought by the Commonwealth of Puerto Rico for alleged natural resources damages due to contamination of the waters of Puerto Rico by a gasoline additive known as MTBE, Mr. Cepeda-Díaz is part of the team which handles various aspects of the case, including pretrial discovery and the development of litigation strategy. Mercado-Vega, et al., v. Bio-Medical Applications of Arecibo, Inc., Civil No. 08-1419 (JAG) (D.P.R. ): In this tort action, Mr. Cepeda-Díaz was part of the litigation team which tried this case before a jury, resulting in an award of damages significantly lower than the plaintiffs’ pre-trial settlement demands. Santiago-Montañez v. Bio-Medical Applications of Caguas, Inc. Civil No. EDP2010-0064 (404) (Puerto Rico Superior Court – Caguas Division): In this tort action, Mr. Cepeda-Díaz led the litigation team which tried the case before a Superior Court Judge. The resulting verdict was only a fraction of the plaintiffs’ pre-trial settlement demands.